If you follow me on Twitter or Tumblr you may be tired of hearing about this already, sorry. My husband has been swamped at work. I’ve been swamped at home and the back to school has proved more stressful this year than previous. So my husband had this idea (let’s remember whose idea it was) that he would re-arrange his vacation time and we should take a long weekend up at the his family’s cabin. The kids had no school on Monday so since it was still early in the year he thought we could pull them from class on Friday and have four full days at the lake. Horrid traffic, lots of swearing. Barely making it out of the state before needing to stop. Diner at the Worlds Largest Culver's which included fighting over getting PBgirl to actually consume the grilled cheese and me allowing PBbaby to “eat” green beans, Arriving at the house at 10:30 and having kids up until Midnight. PBgirl waking up in the middle of the first night with a croup cough and fever. Breaking my only pair of glasses. Day trip about an hour away that included us nearly running out of gas in the middle of no where and PBgirl getting sicker. Two totally and completely failed dinners. We could not cook anything right. The weather getting warm and sunny as we were leaving. It was really a comedy of errors the whole weekend, these are just the most memorable errors. I was starting to doubt that we could do simple weekend only trips. So much work not enough reward. On the way home we were making great time and the Culver’s we stopped at happened to share a parking lot with Target. Since PBgirl takes a year and half to eat a sandwich I had time to run over and see if they maybe, possibly, fingers crossed had any Missoni left. I walked in and right there at the front doors was a still somewhat stocked display. It was like the sky opened and angels started singing. I may have squealed. I may have spent way to much money. I usually wait out the designer collections, in my area there is usually some to be found on the clearance rack and a lot of times the quality or fit is kind of off...but the Missoni collection is really well done. If I wasn’t wearing the baby I may have jumped and kicked my heels on the way out. I may have walked into the Culver's giggly like a school girl. That vacation really did turn around!! Congrats on your great finds. 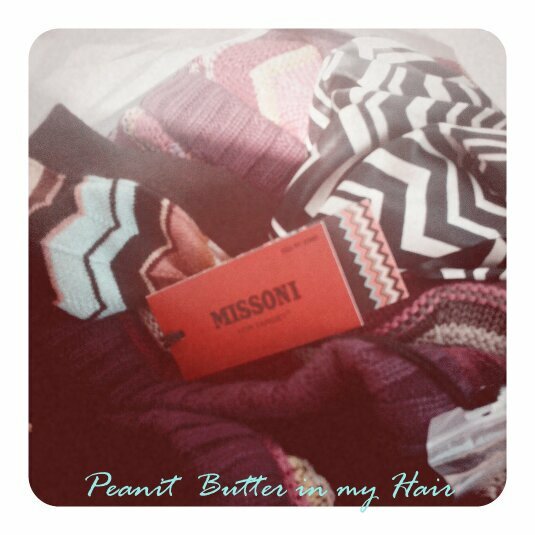 I haven't yet ventured into Tar-jay to check out the Missoni. I fear for the security of my mortgage if I do. This just goes to prove my theory that there are few things a little shopping can't fix! Glad to see your weekend turned around! 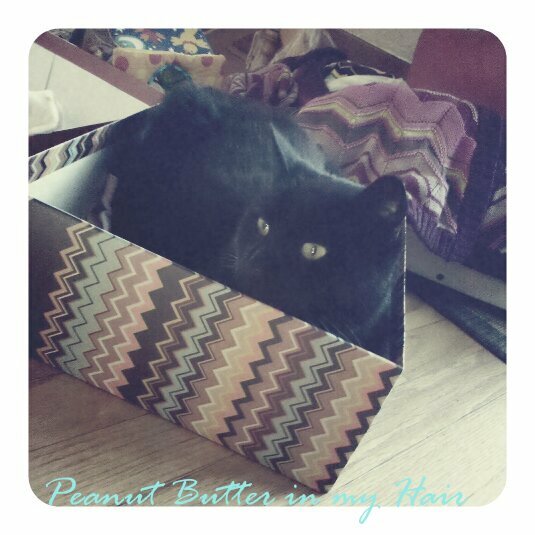 That cat in the box is TOO cute and totally knows fashion :). You did good by salvaging a trip with some shopping love!